April 17, 2019 | Hubble Image of the Week – Comet or Cluster? 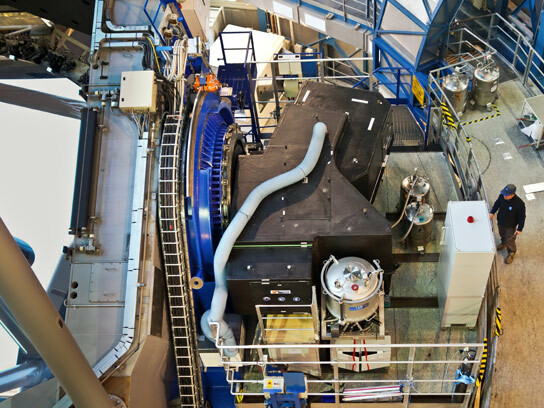 The SPHERE instrument is shown shortly after it was installed on ESO’s VLT Unit Telescope 3. The instrument itself is the black box, located on the platform to one side of the telescope. Using the new extreme-AO instrument SPHERE, researchers image the prototype eclipsing post-common envelope binary V471 Tau in search of the brown dwarf that is believed to be responsible for variations in its eclipse arrival times. The new SPHERE instrument on ESO’s Very Large Telescope has been used to search for a brown dwarf expected to be orbiting the unusual double star V471 Tauri. SPHERE has given astronomers the best look so far at the surroundings of this intriguing object and they found — nothing. The surprising absence of this confidently predicted brown dwarf means that the conventional explanation for the odd behavior of V471 Tauri is wrong. This unexpected result is described in the first science paper based on observations from SPHERE. 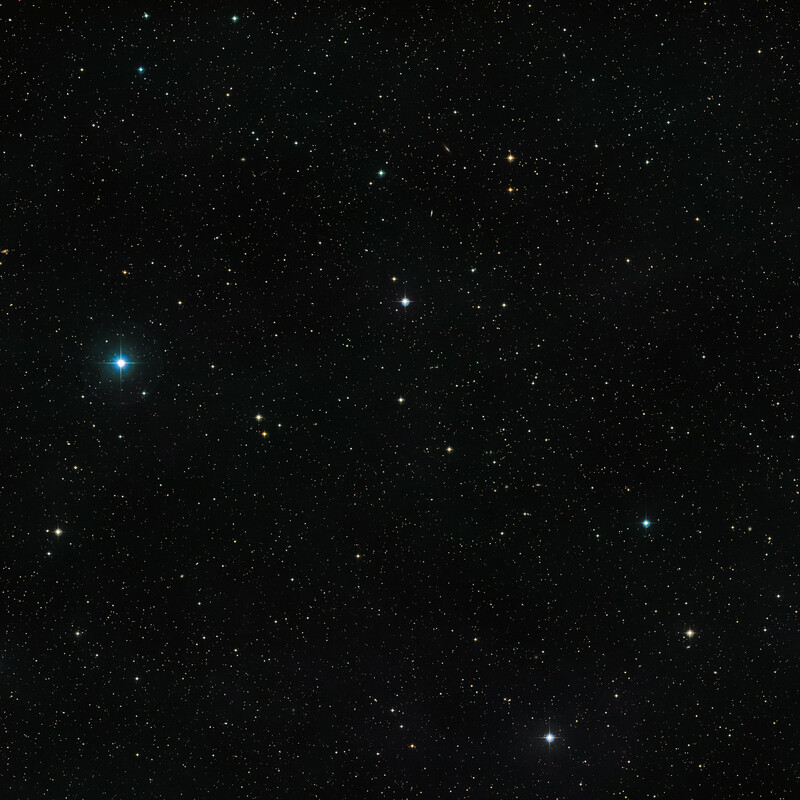 Some pairs of stars consist of two normal stars with slightly different masses. When the star of slightly higher mass ages and expands to become a red giant, material is transferred to other star and ends up surrounding both stars in a huge gaseous envelope. When this cloud disperses the two move closer together and form a very tight pair with one white dwarf, and one more normal star . One such stellar pair is called V471 Tauri . It is a member of the Hyades star cluster in the constellation of Taurus and is estimated to be around 600 million years old and about 163 light-years from Earth. The two stars are very close and orbit each other every 12 hours. Twice per orbit one star passes in front of the other — which leads to regular changes in the brightness of the pair observed from Earth as they eclipse each other. This picture shows the sky around the unusual double star V471 Tauri. 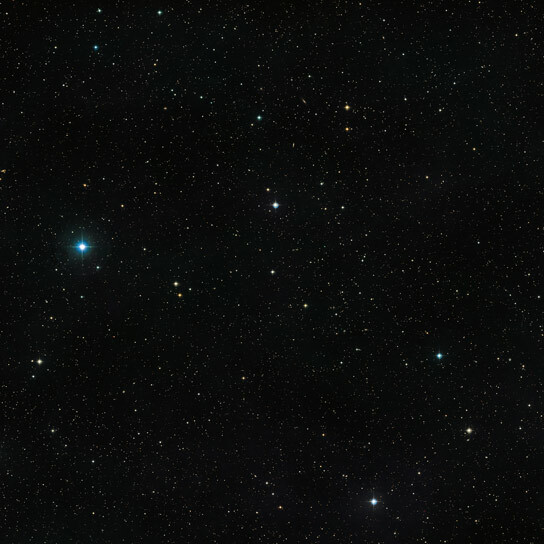 The object itself is visible as an unremarkable looking star of moderate brightness at the center of the image. This picture was created from images in the Digitized Sky Survey 2. A team of astronomers led by Adam Hardy (Universidad Valparaíso, Valparaíso, Chile) first used the ULTRACAM system on ESO’s New Technology Telescope to measure these brightness changes very precisely. The times of the eclipses were measured with an accuracy of better than two seconds — a big improvement on earlier measurements. The eclipse timings were not regular, but could be explained well by assuming that there was a brown dwarf orbiting both stars whose gravitational pull was disturbing the orbits of the stars. They also found hints that there might be a second small companion object. Up to now however, it has been impossible to actually image a faint brown dwarf so close to much brighter stars. But the power of the newly installed SPHERE instrument on ESO’s Very Large Telescope allowed the team to look for the first time exactly where the brown dwarf companion was expected to be. But they saw nothing, even though the very high quality images from SPHERE should have easily revealed it . “There are many papers suggesting the existence of such circumbinary objects, but the results here provide damaging evidence against this hypothesis,” remarks Adam Hardy. If there is no orbiting object then what is causing the odd changes to the orbit of the binary? Several theories have been proposed, and, while some of these have already been ruled out, it is possible that the effects are caused by magnetic field variations in the larger of the two stars , somewhat similar to the smaller changes seen in the Sun. “A study such as this has been necessary for many years, but has only become possible with the advent of powerful new instruments such as SPHERE. This is how science works: observations with new technology can either confirm, or as in this case disprove, earlier ideas. This is an excellent way to start the observational life of this amazing instrument,” concludes Adam Hardy. Such pairs are known as post-common-envelope binaries. This name means that the object is the 471st variable star (or as closer analysis shows, pair of stars) to be identified in the constellation of Taurus. The SPHERE images are so accurate that they would have been able to reveal a companion such as a brown dwarf that is 70 000 times fainter than the central star, and only 0.26 arcseconds away from it. The expected brown dwarf companion in this case was predicted to be much brighter. This effect is called the Applegate mechanism and results in regular changes in the shape of the star, which can lead to changes in the apparent brightness of the double star seen from Earth. Be the first to comment on "Disproving the Predicted Brown Dwarf around V471 Tau"
Email address is optional. If provided, your email will not be published or shared. SciTechDaily: Home of the best science and technology news since 1998. Keep up with the latest scitech news via email or social media. What Was The Universe Like Before The Big Bang? Hubble Image of the Week – Comet or Cluster? Copyright © 1998 - 2019 SciTechDaily. All Rights Reserved.